Middle school students have unique needs. If you’ve spent more than a day in a classroom with these awesome adolescents, then you know…well, you know a lot of things. careful scaffolding (see more on Scaffolding). What are the most effective strategies? How can instruction be tailored for middle school needs? Self-expression. 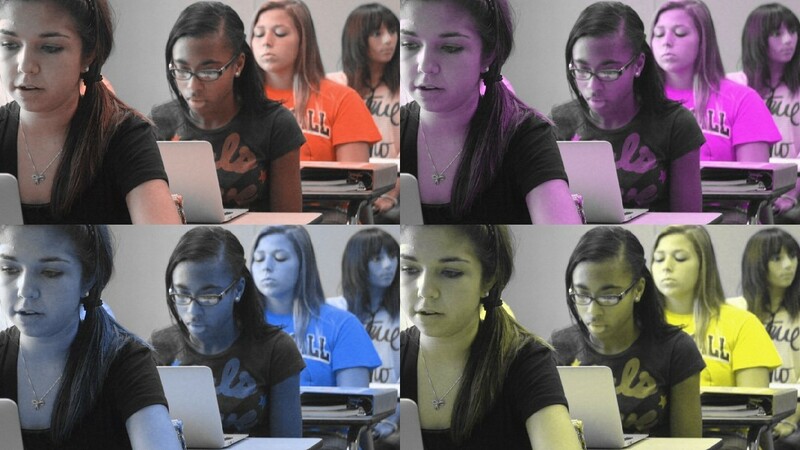 Middle school students love to explore their newly developing identity…sometimes in off-task ways. Incorporate opportunities for creativity and expression when possible. Physical movement. Every 10-15 minutes should provide opportunities for physical movement. Their growing bodies and minds need an outlet and physical movement will help. Read more on the research and uses of physical movement. Give responsibility. It was just 200 years ago and kids were working, farming, and holding jobs. Middle school is the right time to give students choice in their learning. Choice allows them to take responsibility for the work and learning they do. Provide pathways. What kind of choices should middle schoolers have? Different pathways to learning. Instead of teaching one way to take notes, teach three different ways and give students the responsibility to choose. Pathways can apply to projects, reports, problem-solving approaches and more. Utilize a variety of technology such as TenMarks, Think Through Math, and Cool Math Run. Make learning visible with feedback. Middle schoolers often know when they are struggling, but they may not know what they don’t know. Read more on visible learning. 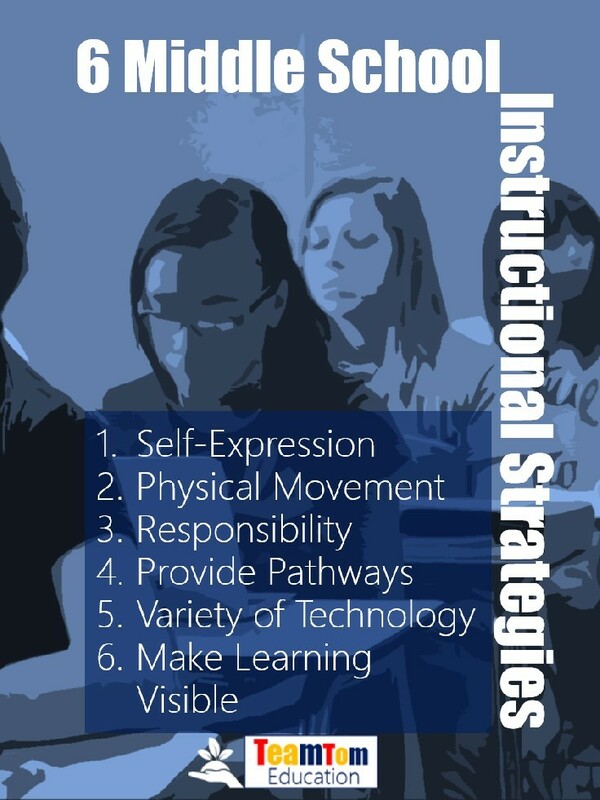 These are general strategies for all areas. Let’s look at a few specific strategies. Vocabulary instruction is important in middle school. Academic terminology increases in complexity in grades 4-6 and continues to do so. Without a solid vocabulary foundation, students miss out on learning due to a lack of conceptual background. Seeing visual examples of a concept, then contrast the examples with non-examples. Discussing the distinct differences between words. Separately listing all of the words associated with two academic terms. Then making connections between the two word lists. Providing visuals or objects that represent a concept. Allow students to explore these and try to explain the concept through collaboration. Then confirm or refine their explanations with your own. After hearing, discussing, and exploring a concept, students should describe the concept and make a visual of the concept. To deepen understanding of previously learned concepts, have students create analogies comparing word to newly learned concepts. How are they similar? How do they differ? Reading is about examining the text – not just blasting through it. Close reading encourages the skills students need to independently unpack meaning in text. On the first reading, students should underline or highlight key words and phrases. On the second reading, students should notice patterns in the text. Students write brief notes about the patterns, repeated details, or main ideas. Read more on Close Reading Strategies. Relationships. Yes, in every subject, find the things that interest them and make connections. Make it fun and engaging. Quizlet, Kahoot, TeamTom Task Cards, and other activites will find more successful engagement than a simple teach and listen. Guided Math. Present math in the easiest approach possible. Guided math is a great format. Read more about Guided Math and Math Games at Mathly Winks. The old sitcoms have commercial breaks every 8-12 minutes. They do that for a reason: attention span. The middle school mind also needs a break every 10-15 minutes. This age group (ages 10-15) are experiencing the largest brain growth during human development. They need active learning, challenging tasks, and a variety of ways to process. Remember, Worksheet Don’t Create Dendrites.